Climbing like a bunch of girls: Puerto Rico. I live in Ontario. I love climbing. I hate being cold. Solution: find an affordable tropical climbing destination. If you are looking for somewhere warm, sunny, and full of limestone, Puerto Rico may be a good option. This was actually my second climbing trip to San Juan. It was so great the first time that I could not resist going back for more! Probably one of the best things about Puerto Rican climbing is the variety. At any given crag there are well rated climbs from 5.8 into the 12’s. That said; for this trip we stuck to the Nuevo Bayamón and Caliche Crags – it is worth noting that wherever you choose to climb you will need to rent a car. With lots of options for route styles and lengths, you can really choose your own adventure. Whether you are into pumpy shoulder pulls on 30 foot overhangs, crimpy balance moves on a face, or an all out endurance fest on 110 foot single pitch, there is something that will capture your imagination and inspire you to send. Alison and Karen warming up on side by side routes. The blog may be new, but the Climb Like a Girl movement began years ago in Toronto. This week Jane shares with us what motivated her to connect with her fellow lady crushers, and create a growing community! I started climbing in 2012. Like most people I went to go check it out, got the 2 week membership since it was such a good deal and from there I was hooked. It wasn’t until a year later that I founded Climb Like a Girl – Toronto. 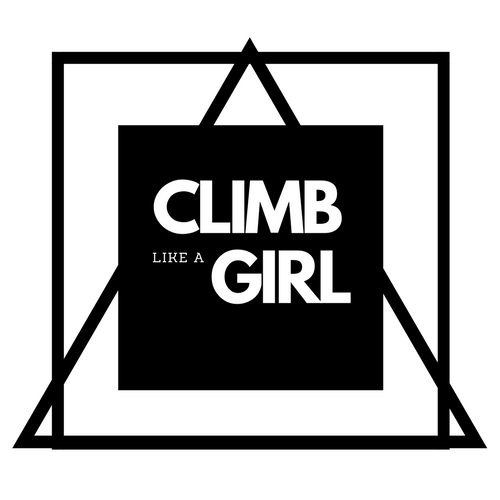 Our Climb Like a Girl facebook group is simply a safe space for female (identifying as female) climbers to ask questions, share stories and find climbing partners. In the beginning of my climbing journey I was extremely self conscious and uncomfortable. I started climbing with Tyler (my sweetie) and he just seemed to be good at it right away and got better at it really quickly. I remember a V0 that took me maybe a month to send. At the time I had no friends at the gym, only Tyler and he was moving on to V1’s and V2’s where I couldn’t even do this damn V0. I felt like a huge loser. To back up this loser image I had it in my head that I wasn’t athletic. I hadn’t participated in sports when I was younger and I felt very out of place in a gym. In fact I made my early gym experiences very hard for myself because I told myself that everyone else was sporty and athletic and that we wouldn’t have anything in common so I was very shy. On top of my loser image and sedentary lifestyle I had this very convincing story that I told myself so much that I believed it to be the truth and it was very real to me. I believed that I “didn’t like girls” and that I just “got along better with guys”. I distanced myself from many women and didn’t make friends with them intentionally because of preconceived notions that we would not get along. So there I was. Shy, out of shape and avoiding other girls at the gym. That first year was mentally tough for me. I would often only climb in empty areas of the gym and if someone came in to my area to climb I would leave. I would only climb when the gym was quiet. I remember a few times just leaving because I was too self-conscious to climb in front of so many people. I believed I was ‘wasting their time’ if I was taking up space on the wall when they could be climbing. I saw myself as weak and I was very intimidated by everyone who was better than I was. I had a really self deprecating internal dialogue going on. During all of my struggles at the gym; climbing, falling, jumping off the wall being too scared, feeling weak, worrying if my leggings were see through. I just wished that I had a friend who was like me, who climbed like me, who was at a similar level to me. Someone to cheer me on and have fun with. I wished I knew how to make friends at the gym. I wished it was easier to find someone. I knew it right then. The thing that I had wished existed was going to be my community project. I knew I had to make that space for women to find each other and climb together. Soon the Climb Like A Girl group was born into the facebook world. In the first year of Climb Like a Girl the best and worst part was telling people about it and asking them to join. It was hard to tell people. I was embarrassed! Who the hell am I to start a group? I wasn’t an experienced climber and I barely knew anyone. I was new to the community and I was scared to be called out as a fraud. I was also scared that maybe people didn’t need a group like that. Maybe everyone was fine and it was just me who thought there was a need for this. However, I kept telling people, and asking people to join, and writing it down on little pieces of paper for people. Slowly, slowly it grew. As my group online grew my group at the gym grew too. I was climbing regularly 3 times a week and my group of friends was climbing the same days. I was making friends with GIRLS and we were CLIMBING TOGETHER!! It was just magical for me to have that experience. Since then my whole perspective of myself and who I know myself to be has changed. I became very outgoing and friendly at the gym, I was introducing myself, cheering people on, making friends, climbing hard and having a great time! A Climbing Story by Jennifer Fleming. Each and every one of us is drawn to climbing from something deep inside of us. This week we have the privilege to share the inspiring story of how guest contributor Jennifer Fleming came to love the sport and find herself after some unexpected life changes. I started climbing right around the time my last relationship started to turn towards it’s end. I may have known that end was coming, I may have been in denial. I may have been trying to figure out how I could salvage my own sanity and self worth from the wreckage with which I was soon to be surrounded. After a conversation with a friend, he said, “Well, let’s go then! A friend of mine is a long time climber at this gym in Burlington. She can help us figure it out.” And on a lark, we were off. Spring has officially arrived! Soon all those itching for real rock will be rewarded for their patience. Climbers will be arriving in droves to their favorite climbing spots each sunny weekend, and migrations south are happening as I type. With 2 new guidebooks coming out for Ontario we can only assume to see a few more people enjoying the local Crags than last year. Now sometimes things can feel a bit crowded, but if everyone (newbies ad vets alike) follow the same set of rules for outdoor climbing, then we can all focus on sending our next project, enjoying the sunshine, and appreciate each others excitement to be outdoors. So without further delay here is a quick review of Crag etiquette. we may have to recruit some serious reinforcement to get you in line. Unfortunately there are no climbing police so fierce cut-eye, and better yet friendly reminders will have to do. The Top 10 Reasons to Climb with other Women. Girl Beta. Maybe it’s the extra flexibility, the height, a reliance on footwork, or maybe we are just extra crafty – but ladies come up with the most fun and creative solutions! The positive and supportive vibes. Ever notice how we all gravitate towards climbers that have their try hard on, just so we can quietly (or not so quietly) cheer them on. Everyone there wants to see you send your project, no matter the grade. You can wear whatever you like and no one cares. It doesn’t matter if you want to climb in a sports bra and short shorts (without anyone staring), or an old pair of pajama bottoms with more holes than a sieve… just maybe ask before you post a pic for the whole world to see. You can scream like a howler monkey, or channel your inner Maria Sharapova. If it helps you send, all the power to you. We also accept silence. It really is a come as you are atmosphere. Forgot your chalk, hair tie, sports bra, lunch, (pretty much anything you can think of) at home? No problem, If you forget something, it is likely someone has you covered. Just don’t forget your shoes, those are a little more size specific. Motivation, not competition. The excuses fade away when you see someone who climbs like you crush your problem. Beyond cracking the beta, sometimes we just need to see that it can be done. You can talk about whatever you want without embarrassment. Poop is a for some reason a surprisingly popular subject on trips. But nothing is out of bounds. Nothing. You’ll encourage others. Especially those who are new or returning to the sport. We all have our own local girl crusher crushes. There is a good chance that you already are, or will be someone’s at some point. When people see a bunch of women climbing instead of a scattered few, it’s harder to forget or ignore that we may want different things than our male counterparts. As a group/community, our needs are more likely to be be addressed. Until next time ladies, Climb On!